Custodian of the Two Holy Mosques King Salman bin Abdulaziz was proclaimed the seventh king of Saudi Arabia on 23/01/2015, upon the death of Custodian of the Two Holy Mosques King Abdullah bin Abdulaziz. 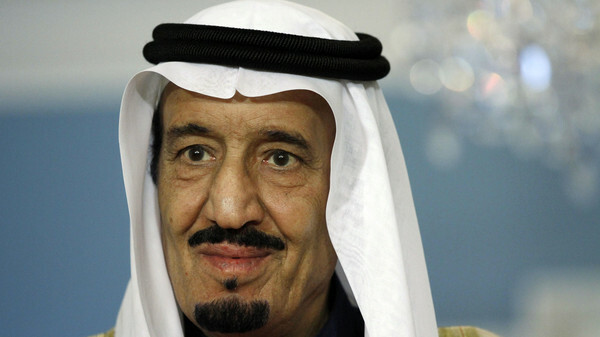 King Salman is the Prime Minister of the Council of Ministers. King Salman Bin Abdul Aziz was born in Riyadh on 5/10/1354, corresponding to 31/12/1935. He received his early education at Princes’ School in Riyadh, which was established by King Abdulaziz in 1356 to provide education for his children. There he studied religion and modern science, and celebrated the completion of memorizing the whole Quran on Sunday, 12/8/1364 H.
The school was managed by Sheikh Abdullah Al Khayat, imam and preacher of the Grand Mosque. He served as deputy governor of Riyadh from March 1954 to April 1955, and governor of Riyadh from April 1955 to December 1960 and again from February 1963 to 5/11/2011, when he was appointed defense minister. Since 1956, King Salman has chaired various humanitarian and service committees that provide relief from natural and man-made disasters. For his humanitarian services, he has been awarded many medals and decorations, including awards from Bahrain, Bosnia and Herzegovina, France, Morocco, Palestine, the Philippines, Senegal, the United Nations, Yemen, and the King Abdulaziz Medal – First Class. He is a recipient of several honorary degrees and academic awards, including an honorary doctorate from the Islamic University of Madinah, the Prince Salman academic award, and the Kant Medal by the Berlin-Brandenburg Academy of Sciences and Humanities. On Tuesday, 11/7/1373 H, corresponding to 16/03/1954, Prince Salman Bin Abdul Aziz was appointed acting governor of Riyadh region. On Monday, 25/8/1374 H, corresponding to 18/04/1955, Royal Order No. 5/10/2/1424 was issued appointing Prince Salman the governor of Riyadh Region at the rank of minister. On Sunday, 07/07/1380 H, corresponding to 25/12/1960, he resigned from the emirate of Riyadh Region, and the approval was issued by the Royal Order No. 40 in 7/7/1380 H.
On Monday, 10/09/1382, corresponding to 04/02/ 1963, Prince Salman was appointed again as the governor of Riyadh Region, according to Royal Order No. 46. On Saturday, 09/12/1432 H, corresponding to 05/11/2011, Royal Order No. A/288 was issued appointing Prince Salman as the defense minister. On Monday, 28/09/1433, corresponding to 18/06/2012, Royal Order No. A / 139 was issued selecting Prince Salman as the Crown Prince and appointing him as deputy prime minister and defense minister. King Salman has great interest in cultural and humanitarian work and since 1376 AH, corresponding to 1956, he has chaired a number of associations, organizations, and main committees of charitable work inside the kingdom and abroad, and sponsored and supported many cultural projects. •	Chairman of the Board of Directors of the Riyadh Philanthropic Society for Sciences, which Prince Sultan University and Prince Salman Oasis of Sciences are affiliated with. •	President of the Prince Salman Prize for Quran Memorization for boys and girls in the kingdom. •	Founder and General Assembly President of the Prince Salman Center for Disability Research. •	Honorary president of the Prince Fahad bin Salman Charity Association for Renal Failure. •	Honorary president of the Saudi Center for Organ Transplantation. •	Honorary president of the Prince Salman Center for Kidney Disease. •	Chairman of the Board of Directors of the Prince Salman Charity Housing Project. •	Chairman of the King Abdulaziz Foundation. •	Chairman of the Board of Trustees of the King Fahad National Library. •	Chairman of the Board of Directors of the History Center of Makkah and Madinah. •	Chairman of the Board of Trustees of Hamad Al Jasser Institution. •	Honorary Chairman of the Board of Trustees of the Prince Salman bin Abdulaziz Award for Young Entrepreneur, which is awarded on the level of the kingdom. •	Honorary president of Riyadh Schools. •	President of the High Commission for the development of Arriyadh. •	President of the Higher Executive Committee for the development of Ad- Dir’iya. •	Secretary-General of the King Abdulaziz al Islamic Foundation. •	Honorary president of the Prince Salman Social Center. •	Honorary president of the Board of Directors of Arriyadh Development Company. •	Honorary president of the Friends of patients Committee in Riyadh. •	Honorary president of the Red Crescent Friends Committee in Riyadh. •	Founder and chairman of the Prince Salman Center for Disability Research. •	Honorary president of the Saudi Charity Association for Genetic Diseases. •	Honorary president of the Adults Mobility Handicap Association. •	Honorary chair of the Saudi Society of Speech – Language Pathology and Audiology. •	Honorary president of the Blind Charity Association in Riyadh. •	President of the Coordinating Council of Charity Associations working in Riyadh. •	Honorary president of the Saudi Charitable Society for Holy Quran Memorization in Riyadh. •	Honorary president of the Saudi Association for Holy Quran and its Sciences. •	Chairman of the Board of Directors of Al-Birr Association and its branches in Riyadh. •	Honorary president of the Social Responsibility Council in Riyadh. •	President of the Supreme Committee for the Endowment of King Saud University. •	Chairman of the Board of Directors of Prince Salman Charity Housing Project. •	Chairman of Orphan Care Association in Riyadh. •	President of the Bin Baz Benevolent Project for Assisting Youth to Marry. •	Chairman of the Board of Trustees of the Abdulaziz bin Baz Charity Association. •	Chairman of the Riyadh Competitiveness Center, concerned with increasing Riyadh’s competitiveness and improving the administrative work inside it. •	Chairman of the Higher Committee and the Preparatory Committee for celebrating the passing of 100 years on establishing the kingdom of Saudi Arabia, which was established in the 5/10/1419 H.
•	Chairman of the Donation Committee for Suez Afflicted People in 1956. •	Chairman of the Primary Committee of Gathering Donations for Algeria in 1956. •	Chairman of the Public Committee for Helping Jordan Martyrs Families in 1967. •	Chairman of the Public Committee for Helping the Palestinian people. •	Chairman of the Public Committee for Helping Pakistan Afflicted People in 1973 in the wake of the war between India and Pakistan. •	Chairman of the Public Committee for supporting the military effort in Egypt in 1973 in the wake of the war between Egypt and Israel. •	Chairman of the Public Committee for supporting the military effort in Syria in 1973 in the wake of the war between Syria and Israel. •	Chairman of the public association for receiving donations for the Afghan fighters in 1980. •	Chairman of the local Committee helping floods-afflicted people in Sudan in 1988. •	Chairman of the Public Committee for gathering donations for the Democratic Republic of Yemen in 1989. •	Chairman of the local committee for providing aid, support and assistance to Kuwaitis after the Iraqi invasion of Kuwait in 1990. •	Chairman of the local committee for receiving donations for people afflicted by floods in Bangladesh in 1991. •	Chairman of the executive association for gathering donations for Bosnia and Herzegovina in 1992. •	Chairman of the executive association for gathering donations for people afflicted by the Egypt earthquake in 1992. •	Executive chairman of the Kingdom Fair between Yesterday and Today which was held in many Arab and European countries and in the United States and Canada during the period 1985/1992. •	Chairman of the executive Committee for gathering donations for the Jerusalem uprising in Riyadh, 2000/1421. •	The Custodian of the Two Holy Mosques has the King Abdulaziz Cordon from the first class, which is considered the highest order in the kingdom of Saudi Arabia. •	The Custodian of the Two Holy Mosques obtained an order on the occasion of the passage of 2,000 years since the establishment of Paris. President Jacques Chirac awarded him the order in 1985. •	The Custodian of the Two Holy Mosques obtained the intellectual efficiency order, which was awarded by late King of Morocco Hassan II in Casablanca in 1989. •	The Custodian of the Two Holy Mosques obtained the award Handicapped Children Association in Saudi Arabia for human service in 1995. •	The Custodian of the Two Holy Mosques obtained the Golden Order of Bosnia and Herzegovina for his support and efforts to liberate Bosnia and Herzegovina. The Bosnian president awarded him the order in Riyadh in March 1997. •	The Custodian of the Two Holy Mosques was awarded the United Nations Shield for reducing the effects of poverty in the world in 1997. •	The Custodian of the Two Holy Mosques obtained the Jerusalem Star Order in 1998. Then Palestinian President Yasser Arafat awarded him the order during a ceremony at the regimen palace in Riyadh. •	The Custodian of the Two Holy Mosques obtained the Sikatuna order in 1999 that is considered the highest order in the Philippines. Filipino President Joseph Estrada awarded him the order during his highness’ visit to the Philippines for his significant contribution to human activities, his support of charity associations, his efforts in raising and improving the concept of Islamic culture, and for the many times in which he helped Filipino employment in the kingdom and for his friendship with the Philippines. •	The Custodian of the Two Holy Mosques obtained the Grand Order, which is considered the superior order in Senegal. Senegalese President Abdou Diouf awarded his highness the order during his highness visit to Senegal in July 1999. •	The Custodian of the Two Holy Mosques obtained the Yemen Unity Order from the second class in Safar 1422H /May 2001AD. Yemeni President Ali Abdullah Saleh awarded him the order during The Custodian of the Two Holy Mosques visit to Yemen – Aden. •	His highness obtained the Baden-Powell Scout Fellowship by His Majesty the King of Sweden Carl Justav the Sixteenth in Safar 1429 H/February 2008. •	The Custodian of the Two Holy Mosques obtained the Bahrain Award for Human Work for the Gulf Cooperation Council in Safar 1429 H/February 2008. •	The Custodian of the Two Holy Mosques obtained an honorary doctorate in arts from Umm Al-Qura University in Mecca, in appreciation and recognition of his great role in arts on 21/04/1429 H, corresponding to 29/03/2008. •	On Muharram 1431 H, corresponding to December 2009, the Custodian of the Two Holy Mosques obtained the International Olympiad Award of the Middle East and South Africa Region, which is considered its highest award, and was given to him for his efforts in serving the handicapped people in the kingdom and encouraging research in the field of disabilities. •	On Safar 1431 H corresponding to January 2010, King Salman obtained the Bosnian Order for Islamic Grants from the first class as an appreciation for The Custodian of the Two Holy Mosques’ efforts in Islam and Muslims advocacy in Bosnia and Herzegovina. His eminence Chief Scholar and the General Mufti in Bosnia and Herzegovina, Dr. Mustafa Tseretsh, awarded the Custodian of the Two Holy Mosques the order at his highness’ office in Riyadh Principality. •	On 29/04/1431 H, corresponding to 14/04/2010, the Custodian of the Two Holy Mosques obtained an honorary doctorate from the Islamic University in Delhi for his charity work and his commitment to support education and his uniqueness as a statesman. •	The Custodian of the Two Holy Mosques obtained the “Kant” medal on 19/6/1431 H, corresponding to 2/5/2010, during his formal visit to Germany. The Berlin Brandenburg Academy for Science awarded him this medal for his contributions in the fields of science. •	On 24/04/1432 H, corresponding to 29/03/2011, the Custodian of the Two Holy Mosques obtained an honorary doctorate in Saudi Country History from the Islamic University in Madinah for his distinct efforts and grants in maintaining the great Saudi history and observing its different effects in various fields.